Standardize your business process and create consistent projects with Taskfeed Templates. There are lots of different ways to use Taskfeed templates to support complex projects without having to create tasks from scratch. The Task Template Import Wizard is available with Taskfeed Summer ‘18 (versions 13.24 and above). Please contact us if you have opted out of auto-upgrades. 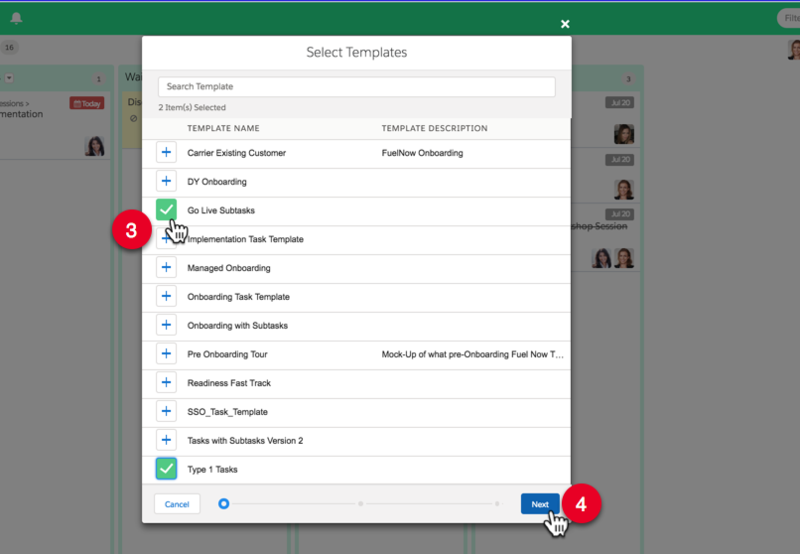 With the new Template Import Wizard not only you can import any Task Template onto a Board or a Task (to create Subtasks), but you can import multiple templates at the same time! From the Taskfeed tab, select a Board from the Board menu. 1. Select the Board View, then click the dropdown button ( ) next to the Board Name. 3. Click on one or more templates to import. You can use the Search Template bar to find a template quickly. 5. Select or deselect Tasks to import. All Tasks from the templates selected in the previous step will be included by default ( ). Exclude Tasks by deselecting those you don’t wish to import. Tasks with a ( ) won’t be imported. 7. Taskfeed will check for errors and duplicates. Templates with a ( ) will be imported.